“Families fill our lives with happiness and laughter, leaving us memories to treasure today and forever after.” –Unknown. Keep the treasure of today, forever, with family portraits. Family portraits are one of the more pleasurable photography sessions we have at Kimi Photography. The smiles and laughter of the children are so contagious. Because of this, the families often forget that they are being photographed. It is this fun and comfortable environment that Kimi Photography specializes in, allowing us to photograph you naturally and candidly. Every family photography session involves detailed planning ahead of time. From location, creative situations, attire, and more, we make sure that the theme and setup perfectly reflect you and your family. You will be involved from the very beginning. Before your photo session, we will brainstorm ideas for your photos. Keeping in touch prior to the shoot will also allow us to get to know each other and discover the love and personality of your family. We want to capture you in a way that reveals your family’s unique dynamic, in the most natural way possible. 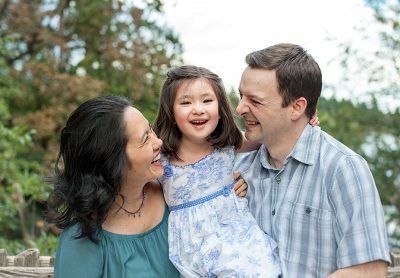 Every family photography session is unique, catered to each family’s personality, and, most importantly, full of FUN, LAUGHTER, and SMILES. Lasting about two hours, we visit a 1-2 locations around the Portland, Oregon area, depending on the proximity between each. Anyone can take a photograph, but it takes a certain passionate heart and creative eye to capture your family in the purest and rawest form. Kimi Photography has the passionate heart and creative eye to capture just that. Are you unsure? Come meet us. During our first meeting, feel us out and see if our personality and style matches yours. If we aren’t, no hard feelings. We understand how important your family portraits are and want to make sure we are the best fit for you and your family. But most likely, our fun personality, contagious energy and smiles, and creative approach to photography will be what you are looking for. Our Family Portrait Session packages including digital files start at $700. We specially craft heirloom and artisan prints, albums and folios as well as an à la carte menu for individual pieces. Please inquire for pricing & availability here.